Our 2011 calendar has arrived. The calendar for 2011 is a thirteen-month calendar that starts with December, 2010. The calendar sells for $10 and contains photos from past years' distributions in some of the countries we visit. 100% of the amount you pay for this calendar goes to buy bedkits for children. It was printed using proceeds from the 2009 "An Evening with Lynette and Friends" concert. For each month, the calendar shows children who have received bedkits from Sleeping Children Around the World in the past. If you don't need a tax receipt, why not buy some calendars. You'll have something to remind you about Sleeping Children all through the year, and you'll be providing bedkits for some deserving children. It makes a great gift for someone else too. You can buy it online on our website. The next session of Learning in Leisure program for mature adults (50 plus) is Tuesday from 9:30 a.m. until noon at Northminster United Church with speakers Dr. Doug Lukinuk (Secrets of Living Healthy after 50) and Peter and Jill Adams (Sleeping Children Around the World). The Kiwanis Club of Kempenfelt Bay celebrates 50 years on Sept. 25 at the ANAF Club, starting at 6 p.m. Come enjoy dinner and hear from guest speaker Dave Dryden who will speak on Sleeping Children Around the World. Tickets are $40. Call Steven at 726-1764. 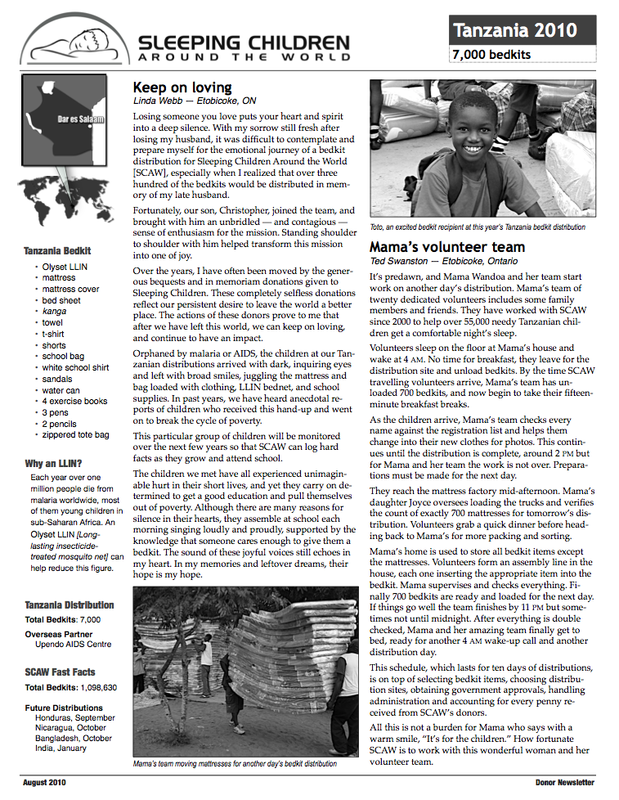 The donor newsletter for the Tanzania bedkit distribution has gone to print and can be downloaded from the Sleeping Children Website. Photos are available in the Tanzania 2010 Photo Album. You can view them by clicking the link above. If you would like to read the reports on the web, you can read them in their entirety here. 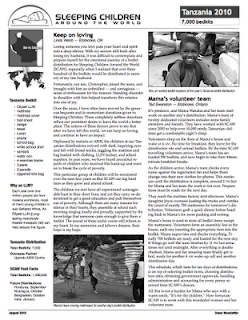 Here is a download link for the PDF version of the newsletter. and Natalie Stephenson, director of sales and marketing. 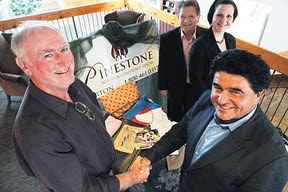 The Pinestone is extending a helping hand and a better night's rest for children in Africa. Vrancor Group's president and CEO Darko Vranich was proud to come to Haliburton's Pinestone Resort, which is part of the hotel group, to announce his $1,500 contribution for the Sleeping Children Around the World charity that purchased 43 bedkits for children in Togo, West Africa. Each bedkit costs $35. It comes with literature about the program and brief instructions and includes a mattress, bedsheet, blanket, towel, mosquito net, clothing items, school supplies such as pencils, erasers and notebooks. All of the contents are made locally, employing people in the area. For different countries the bedkits vary to address specific needs of the area including cultural differences. There were 4,000 bedkits in total that was distributed by cottager, and retired educator, Grant Clark and his wife Leslie Banner when the Canadian team went over to personally hand-deliver the kits earlier this year. Clark, who is a former principal from Peel region, came up to the Pinestone to speak about his involvement with the charity this past Friday. "Through the generosity of the Pinestone, 43 children have had a life-saving experience through this gift," Clark said. "What an enormous circle. Here's Pinestone providing comfortable sleep and what are they doing? They're reaching way across the ocean to Africa." "We have touched the hearts of 54,500 children. The thing that is a little bit unique about the charity is the fact that everybody who volunteers gives their time at no cost," he said, adding he and his wife invested a considerable sum not for the credit, but the incredible experience and the chance to help. They have been on 11 distribution trips and he adds every contribution goes to the bedkits. He started his involvement because of a teacher he worked with who was involved with the charity. People working with the organization pay for their own travel and expenses when delivering the bedkits and also return the following year for an audit to ensure none of the bedkits have been sold. The Pinestone first got involved last year when Clark, who is a golf club member, asked about the resort's involvement with the Sportmen's Bonspiel down in Oakville. The Sleeping Children charity was founded by Murray Dryden of Manitoba, who was a door-to-door peddler and slept in train stations to save money during the Depression. He understood first-hand what it was like to not have a good night's sleep. On a trip to India, Dryden stumbled over a child sleeping on the street and vowed to do something about giving children a comfortable night's sleep. Dryden sold three Christmas tree properties worth $3 million for the cause and deeded his house to the charity. Upon retirement he and his wife Margaret had a goal of raising $1 million, but the organization has surpassed that mark and is now moving towards the distribution of one million bedkits. Thus far the organization has distributed 688,600 bedkits. Donations are accepted via the Internet or through the mail. For more information go to the website: www.scaw.org. As blogged on September 8th, 2010 on the Teddy Bears in the UK website. "Kairi watched Sophia’s video about Sleeping Children Around the World and she wanted to give a child a bed kit. We thought it over and decided that she could sell some of her teddy bears to raise the money needed to buy a bed kit. She made 30 dollars selling the bears and added the other 5 dollars from her allowance. Just today she received the picture of the little boy who received her bed kit. The bed kit was delivered to the Philippines to help a child affected by this fall’s typhoon floods." "I am delighted to be able to tell you that the annual concert An Evening With Lynette and Friends has found a new home." 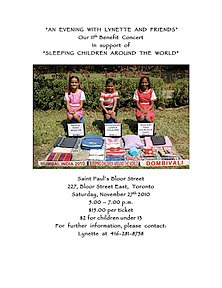 "On the 27th November 2010 from 5 to 7 p.m. we will be having our fund-raising event at St. Paul’s Church at 227 Bloor Street East. As you know, we used to have this event at St. James Cathedral, but rising costs meant we could no longer use their premises." "St. Paul’s has come to our rescue. There is also a shift in the program content. As well as using some of our regulars – we are hoping to add the international flavour of music and dancing from some of the countries we supply bedkits to." "Stay tuned for more news … "